Everyday during training we are trying to learn more about balance. Actually in sensei’s first dvds you could read: “bujinkan: martial arts of distance”. Proper distancing is given by footwork and proper footwork is created by balance. Take a cat for instance. Cats have this ability to always land onto their feet when they fall. This is what we are training to do in the dôjô. But this training requires years of hard work and can only be achieved through trial and error. Cats learn that from early age and when they grow up it is a natural ability they have developed. Often I am amazed by how much we can learn from our daily mistakes. Accepting to make mistakes is accepting to learn. In the dôjô nothing matters and being wrong often ends with only a few bruises. There is no risk to be wrong in training as long as we learn to learn from this practical teaching. An error is not like a black spot on a white linen, it is a reason for improving ourselves. One of the Japanese shihan said one day in class that when we learn a new waza we make many mistakes and that by repeating and learning from these mistakes we make gradually less and less mistakes. This waza will never be perfect but at least will be heading towards perfection. 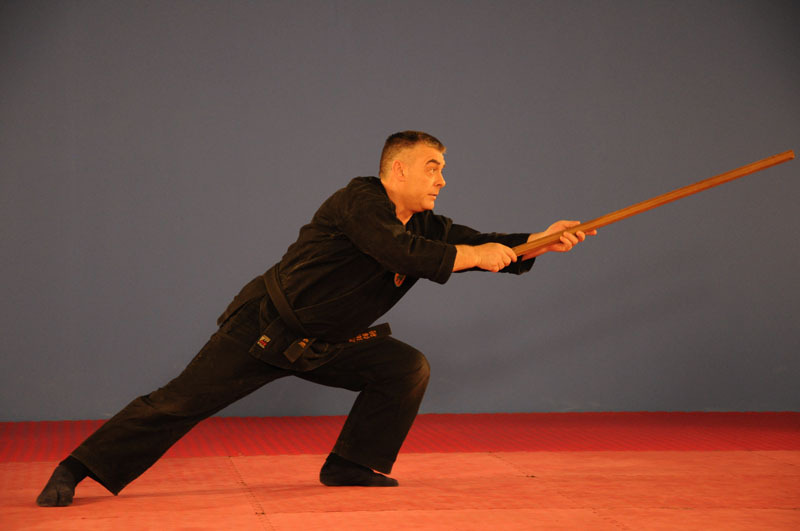 Balance in your taijutsu will bring balance in your life and this is the most important in the Bujinkan martial arts. Errors are making it possible for us to become better practitioners and better human beings. This is why accepting changes is of utmost importance. If you think you know and never change what you take for granted you cannot evolve. The things you know will work for you well in some occasions but will also bring more troubles in the long run. Remember the tao (道), and its “don’t do anything and nothing will be left undone”. Inaction will never bring action, actually by not accepting those permanent changes you are preventing yourself from success; it is like betting your life on a toss of a coin! This is wrong. Whatever you do always consider that things are not stuck, everything evolves and everything flows. This is the nagare (流れ) that we are looking for. Footwork, distance and balance are linked and we accept to change. As Aristotle said “change in all things is sweet”, so we need to look for these changes in our lives and become true human beings. Excelente estimado Arnaud! seguiré aprendiendo de mis errores!! !